Location: Yucatan peninsula, Mexico. 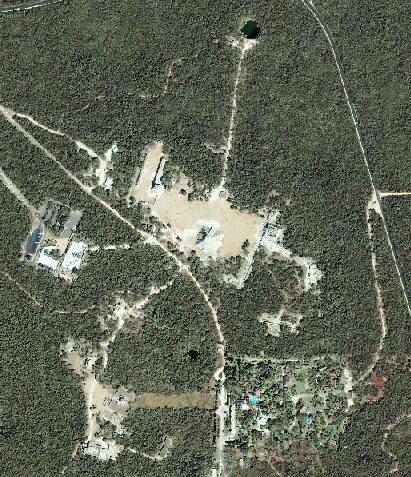 Grid Reference: 20° 40' N, 88° 32' W.
Abandoned sacred Mayan city, once covering over six square miles. Chichen Itza is considered by many as one the most important Mayan complexes in Mexico. It is generally agreed that Chichen Itza was first populated between 500 and 900 AD by Mayans then abandoned around 900, the city was resettled 100 years later and subsequently invaded by Toltecs from the North. 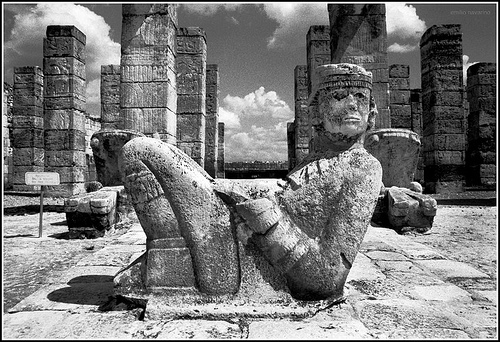 There are numerous relief's of both Mayan gods including Chac and the Toltec gods including Quetzacoatl. For some reason the city was abandoned around 1300 AD, although it remained a pilgrimage centre until the time of the conquest. 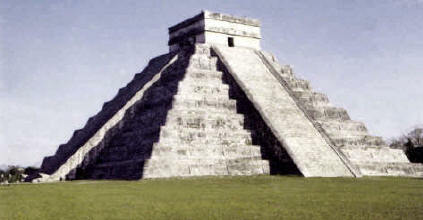 The Mayan name "Chich'en Itza" means "At the mouth of the well of the Itza." Much of the reason for the placement and construction of Chichen Itza is explained in terms of the several 'Cenote's' or 'sink-holes' in the area. These geological features provided the Mayans (and the city itself), a unique connection to the underworld, as demonstrated by the numerous discoveries of skeletons and funerary rights in most of the nearby cenotes and caves in the region. The Cenote Sagrado: (The Sacred Well). Natural Sink -holes (Cenotes) - A long, white limestone road or sacbe, extends north from the base of the north staircase of the great pyramid, El Castillo. The road passes the Temple of Venus and continues for a thousand feet to a large, limestone sinkhole the Maya call "cenote." This is El Cenote Sagrado, the Sacred Well, found at the northernmost point of the Chichen Itza archaeological zone. This large cenote was likely one of the major reasons why the Maya built such an immense city here. The cenote is fed by an underground river, and supplied water for the city as well as served as a location where the Maya conducted religious rites. Almost perfectly circular, the Chichen Itza cenote is more than 50 meters in diameter, and its upper rim stands more than 20 meters from the waters surface. The water itself is almost 15 meters deep with a thick layer of muck at the bottom that has so far proven too deep to measure, or to allow for easy exploration of its depths. 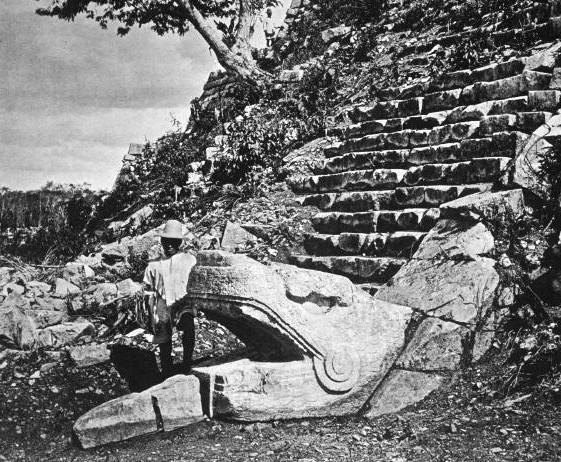 'In 1894, Edward Thompson, the United States Consul in Merida, purchased the plantation which included the ruins of Chichén Itzá. Ten years later he dredged the cenote, recovering artifacts of gold, copper, carved jade and pottery, as well more fragile items such as textiles, spears, and rubber containers that held a form of incense. The artifacts are believed to have been thrown in as offerings to the Maya rain god Chaak. (Note* Some were determined to have come from as far away as Columbia). Thompson shipped the artifacts to the Peabody Museum at Harvard University. 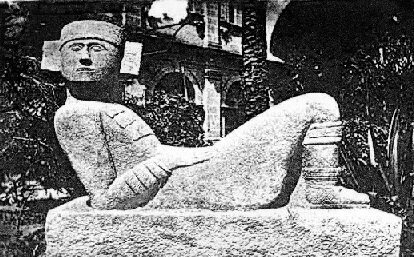 In 1926, the Mexican government demanded the return of the artifacts and tried Thompson on charges of theft. The case went up to the Mexican Supreme Court, which in 1944 found in favor of Thompson. Beginning in 1959, the Peabody Museum gave many of the valuable artifacts but some of it remains on display at Chichén Itzá near a plaque in Spanish that condemns to the Mexican government, which displays some of them in Mexico City. Thompson also recovered numerous skeletons, which lends credence to the early Spanish chroniclers who said the cenote was the scene of human sacrifice. It is known that the Toltec influence on the Maya introduced the concept of human sacrifice to Yucatan. Chichén Itzá also has a sister cenote called the Xtoloc Cenote. Unlike the turgid waters of the Sacred Well, Xtoloc is relatively fresh and pure, prompting the belief that it served as the major water supply for the city while the Cenote Sagrado was reserved for ritual purposes'. There are several other natural 'Cenotes' nearby to Chitchen Itza, stairs leading down the sides of the natural 'sink-holes' and relics discovered inside testify to their importance to the Mayans. In the wells around Chichén Itzá have been found scores of skeletons. Mayan petroglyphs depict human sacrifices at these sites. many have yet to be investigated. A 24m high stepped pyramid-temple, which records the equinoxes in a unique way. The sun creates a shadow of a huge 'snake' to ascend the steps in spring, and descend again in autumn (1). Whether or not this was a deliberate design feature is speculative, but other astronomical features at the site certainly lend weight to the idea that it was intentional. Each step corresponds to a day, each platform to a Mayan month. (17). The architecture of the pyramid encodes precise information regarding the Mayan calendar. Each face of the four-sided structure has a stairway with ninety-one steps, which together with the shared step of the platform at the top, add up to 365, the number of days in a year. These stairways also divide the nine terraces of each side of the pyramid into eighteen segments, representing the eighteen months of the Mayan calendar. The pyramid is also directionally oriented to mark the solstices and equinoxes. The axes that run through the northwest and southwest corners of the pyramid are oriented toward the rising point of the sun at the summer solstice and its setting point at the winter solstice. Photo of the Northern stairwell, 1880. The pyramid was built during the eleventh to thirteenth centuries directly upon the multiple foundations of previous temples. Curiously, the same symbolism can be seen on either side of the huge stairwell leading to the Temple of Queen Hashepsut, in Egypt. 'If you stand facing the foot of the temple and shout the echo comes back as a piercing shriek. Also, a person standing on the top step can speak in a normal voice and be heard by those at ground level for some distance. This quality is also shared by another Mayan pyramid at Tikal'. 'Handclaps evoke chirped echoes from the staircases of the Mayan Pyramid of Kukulkan at Chichen Itza. The physics of the chirped echo can be explained quite simply as periodic reflections from step-faces. What is interesting is that the chirped echo sounds arguably like the primary call of the Mayan sacred bird, the resplendent Quetzal. This magnificent bird, now near extinction, has for thousands of years represented the 'spirit of the Maya'. 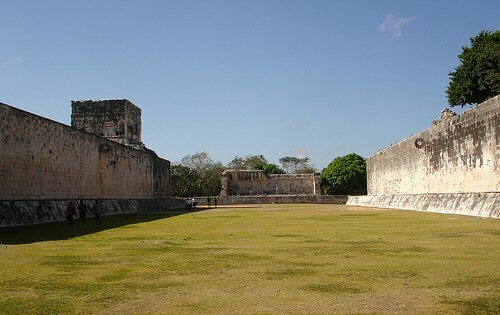 The Great Ball Court: Juego de Pelota Principal (Principal Ball Court) is the main one of eight ball courts, and the largest games court in all of Mexico's archaeological sites. Here, you will see the famous 7m-high stone hoops. It is believed that contestants of pelota (ball) needed to get a rubber ball through them during the game. 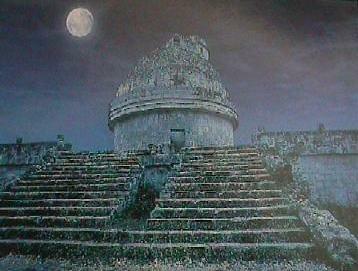 At least one image of a ball with a skull in it is reported at Chichen Itza. 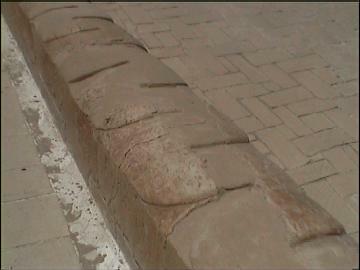 Accoustic Properties of the 'Ball Court': Each end has a raised "temple" area. A whisper from end can be heard clearly at the other end 500 feet away and through the length and breath of the court. The sound waves are unaffected by wind direction or time of day/night. Archaeologists engaged in the reconstruction noted that the sound transmission became stronger and clearer as they proceeded. In 1931 Leopold Stokowski spent 4 days at the site to determine the acoustic principals that could be applied to an open-air concert theatre he was designing. Stokowski failed to learn the secret. To this day it has not been explained. 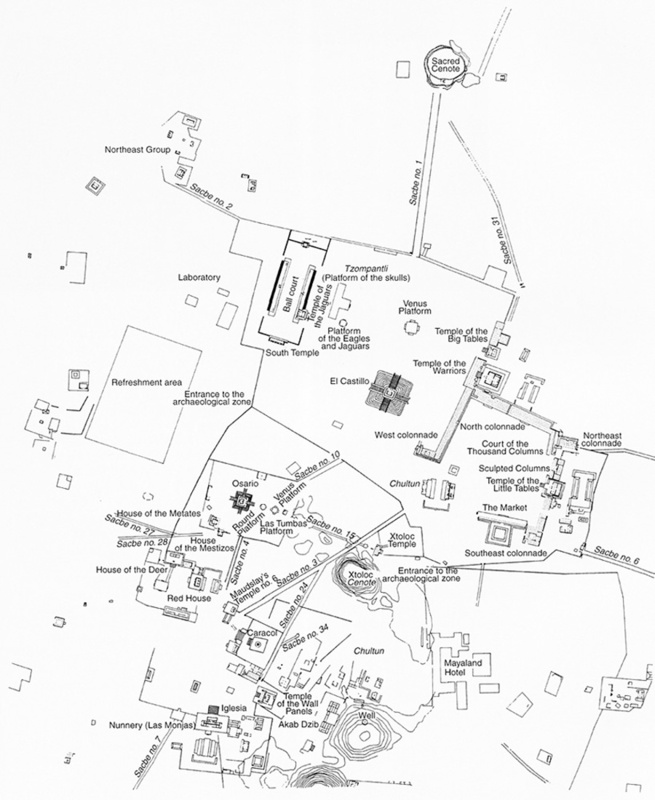 The Carocal (Observatory): Recent studies at Chichen Itza by archaeo-astronomers have revealed that other structures, besides the Pyramid of Kukulkan, have significant astronomical alignments. For example, several of the windows in the unique circular building known as the Caracol were positioned to be in alignment with key positions of the planet Venus, particularly its southern and northern rising extremes on the horizon and with the equinox sunset. 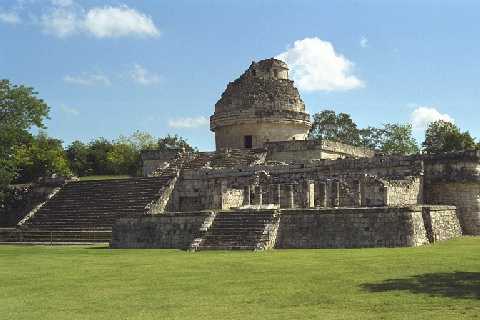 The combined alignments and orientations of El-Castillo and El-Caracol leave no doubt as to the importance of astronomy to the Mayans. 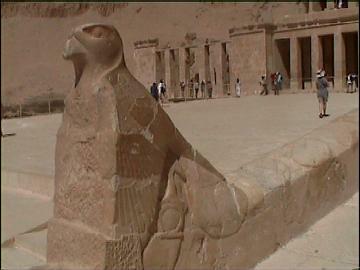 The Chacmool: (The Temple of Warriors). 'The Temple of a Thousand Pillars': This complex is analogous to Temple B at the Toltec capital of Tula, and indicates some form of cultural contact between the two regions. The one at Chichen Itza, however, was constructed on a larger scale. At the top of the stairway on the pyramid’s summit (and leading towards the entrance of the pyramid’s temple) is a ChacMool. 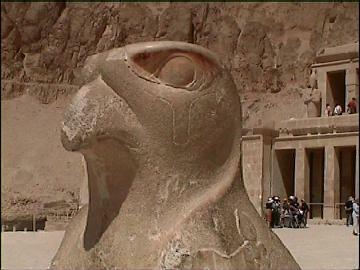 There are several other broken Chacmool around the site. The Ossario: This step-pyramid temple dominates the platform, on a small scale. Like its larger neighbour, El Castillo, it has four sides with staircases on each side. There is a temple on top, but different from El Castillo, at the centre is an opening into the pyramid which leads to a natural cave 12 m. below. Edward H. Thompson excavated this cave in the late 1800s, and because he found artefacts such as jade beads and several skeletons. The same phenomena was reported at both Teotihuacan and the Great pyramid at Giza. Roughly all sources agree that from approximately 550 AD to 800 AD, Chichen Itza existed mainly as a ceremonial center for the Maya civilization. The area was then largely abandoned for about a hundred years (no one knows reason ), to be resettled around 900 AD again. Shortly before 1000 AD, it was invaded by a people from the north (The Toltecs). Mayan historical sources mention that a man who called himself Kukulkan arrived in Chichen Itza from the west (Kukul means “feathered” and kan means “serpent”) in the period that ended in 987 AD. A strong case has been made that Kukulkan and Topiltzin Quetzalcoatl were most likely the same person, and that he brought the Toltec practices and beliefs to Chichen Itza, including the practice of human sacrifice. Approximately 4 km (2.5 mi) west of the Chichen Itza archaeological zone are a network of sacred caves known as Balankanche (Sp: Gruta de Balankanche). On 15 September 1959, José Humberto Gómez, a local guide, discovered a false wall in the cave. Behind it he found an extended network of caves with significant quantities of undisturbed archaeological remains, including pottery and stone-carved censers, stone implements and jewelry. INAH converted the cave into an underground museum, and the objects after being catalogued were returned to their original place so visitors can see them in situ. 1). A. Collins. Gods of Eden. 1998. Headline press. 3). Sam Osmanagich. The World of the Maya. Euphrates Press. 2005. 12). The atlas of mysterious places. 1987. Guild publishing. 17). E. Von Daniken. In Search of Ancient gods. 1976. Corgi.